Welcome to the Gary’s Catering Job Openings page. For decades. 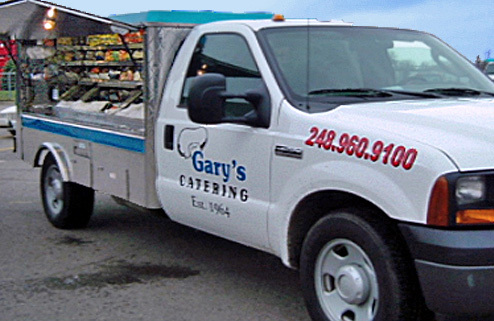 Gary's Catering has offered culinary excellence and superlative service in Southeast Michigan and the Metro Detroit. We provide catering services in Michigan and Ohio for clients who demand the best in food and customer service no matter the location! Breakfast, Lunch, Dinner Private, In-Home, Indoors, Outdoors, Corporate, Office, or Reception settings. These are the current catering service job openings. Gary's Catering is looking for a great person to join our team! Previous employment in the food industry is a plus, as is restaurant front or back of the house experience. *Must have good driving record. Food Truck routes are established and operate Monday through Friday. Shift is approx. 5:00 a.m. to 2:00 p.m.
Also offer great Truck & Route leasing programs. Call (248) 960-9100 x200, email your resume to sheri@garyscatering.com, or please apply in person M-F 8:00 a.m. to 1:30 p.m.
Gary's Catering has a job opening in our Warehouse! Monday thru Friday 4:45 a.m. - 1:45 p.m.
Duties include: General Warehouse maintenance and light mechanical work. Applicant must be punctual, take direction well, and take pride in their work.